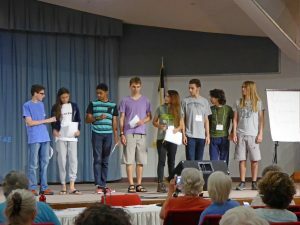 The teen group (grades 8-12) of Southeastern Yearly Meeting met at the Methodist Life Enrichment Center in Leesburg, Florida, from April 12-16, 2017. In addition to participating in worship sharing, retreat sessions, and other activities as part of the wider SEYM community, we also spent time together for learning, fun and business. We joined with several worship sharing groups to have new and different experiences outside of our own meetings. We used this opportunity to listen to different people and change and adapt our own ideas. In addition, we joined the other youth groups on the low ropes course in teamwork exercises where we learned communication skills. On Friday, we went to the intergenerational dance where we relaxed and had fun with other Quakers of all ages. Though we may have not been here for the past year, we have definitely noticed a significant change…there was a growth in the mosquito population! Though these little critters may be happy about our endless supply of food and nice weather, we aren’t happy about being the food! The weather is perfect for mosquitoes, but it’s much too hot for most of the animals. Unfortunately, this warmer weather is becoming more widespread and affecting everything. Now the polar bears will become food for the mosquitoes as well! Fortunately, there is still hope. We can fight against the mosquito empire and win, to protect other animals from becoming the mosquitoes’ dinner. Were it not for Peterson Toscano’s teachings, we would be running around in circles, panicking about the end of the world. When one or a group yearns for calm and silence in the outdoors, there are numerous places to sojourn. One could walk the paths of the forest, pondering and thinking to oneself. Deeper into the trails, lie paths of silence with exquisite views of the lake and forest. If anyone feels the need to pace and ask deep questions of themselves, the hedge maze will serve this purpose. The grassy fields and shady areas that lie under oaks and palms, games are played and children run about. Near the lakeside, beaches await for friends to gaze out at the water and life on the lake. Out upon the lake those that wish, may canoe their way across the water and further immerse yourself into nature. The SEYM Teens discerned that the topic for the 2017-18 year will be Florida water quality. Furthermore, we agreed to start a better relationship with the Earthcare Field Secretary. 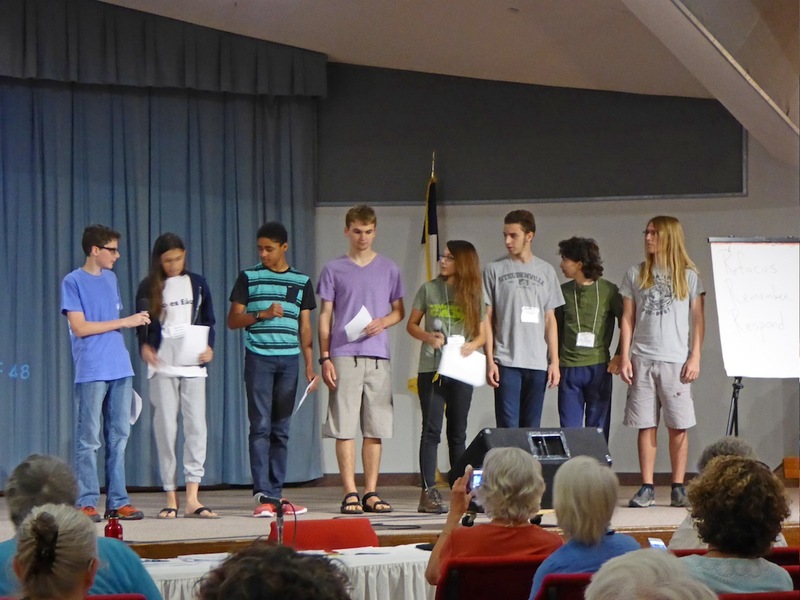 Each teen will facilitate discussion about the Field Secretary at their local meetinghouse. We approved two new co-clerks –Brendan and Vincent – and are excited to face the next year with this passionate team. Friends expressed gratitude to the SEYM for their unity and kindness that the teens enjoyed throughout the gathering.